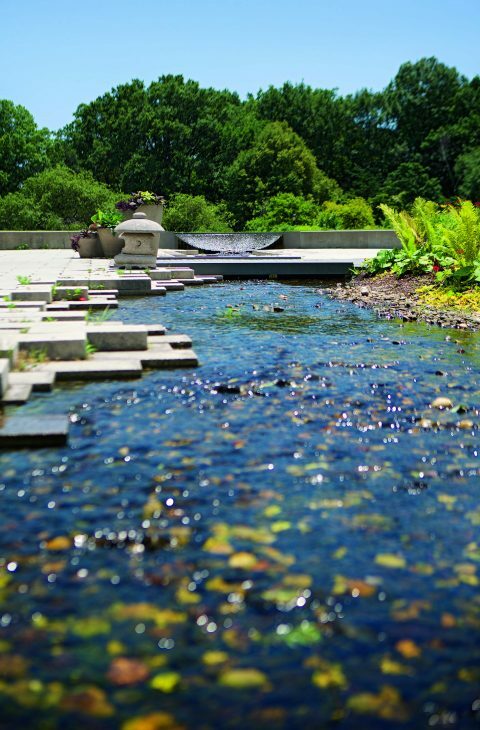 Queens Botanical Garden has four active hives with over 80,000 bees! Each hive produces between 20 and 40 lbs of honey. In 2018, we only harvested from one hive because we introduced new colonies this year. 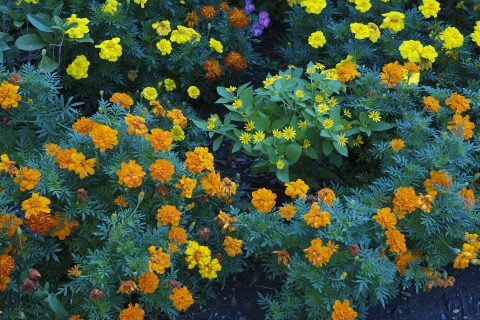 Say hello to our honey bees on your next visit at the Garden. 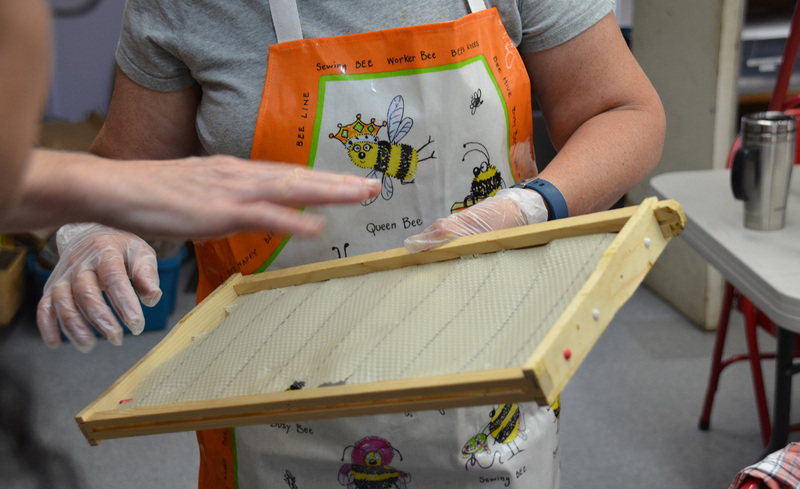 Honey frames are removed from select hives and kept warm with heating pads to keep soft and flow easily! Uncapping is a term used for the removal of caps (the hardened tops) from honeycomb. The tool pictured here is a “cappings scratcher,” which removes caps by flicking off the top 1/8 inch of material to reveal honey. Caps are built by bees to seal in honey and keep it from leaking out of the comb. Caps are removed from the top left portion of this frame and honey has already started to run down the side! This frame seems to contain a darker shade of honey, but is actually the same color as shown in the next slide. This frame contains an older foundation, which is stained by bee feet walking across it, causing it to appear darker than it actually is. Here you can see what a frame with new comb looks like. 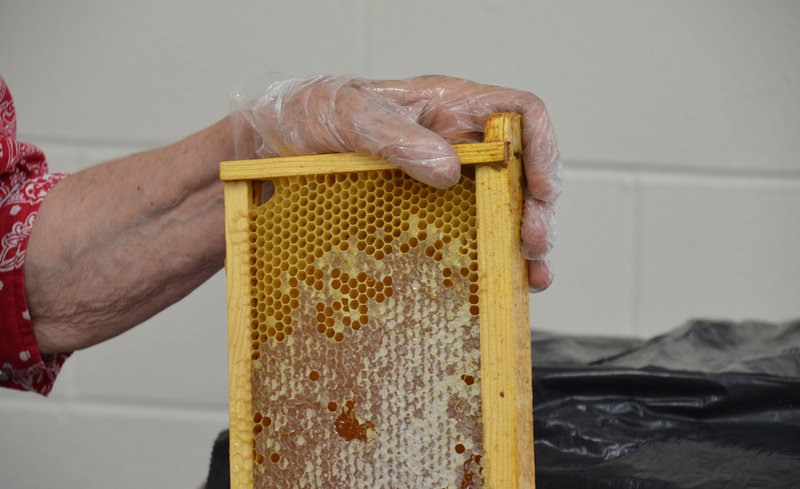 Comb is made up of hexagonal wax cells where honey is formed. 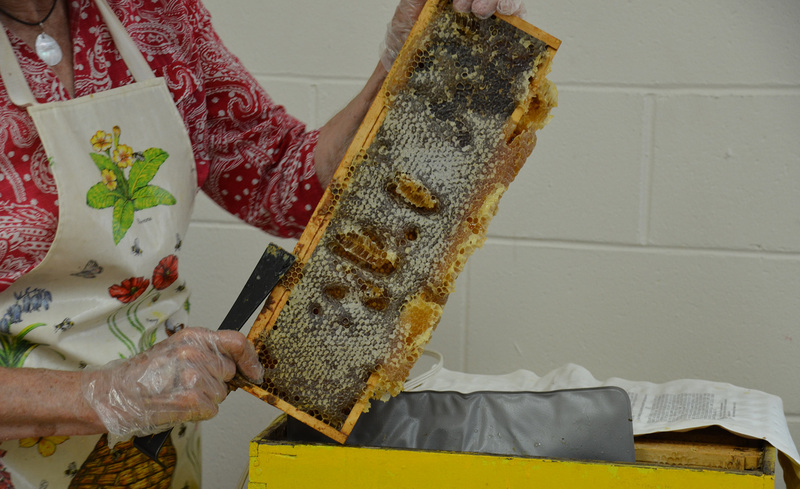 Once we remove the honey, we’ll return the frames, intact, with comb for the bees to build on top of, saving them energy. 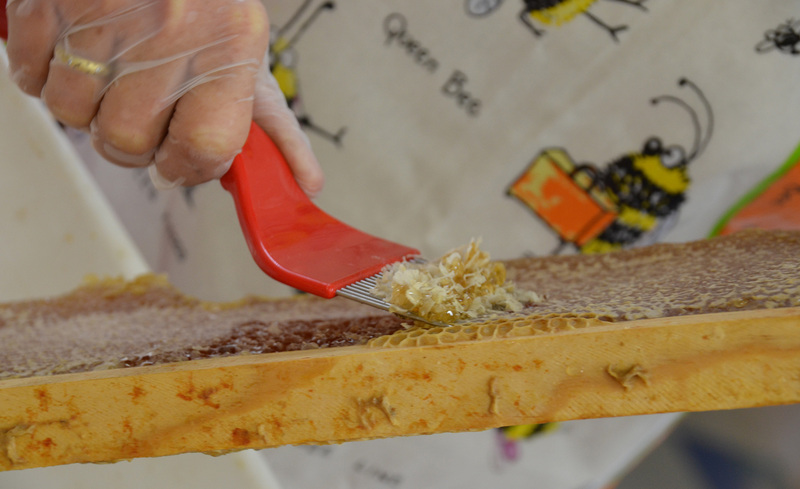 To get our combs nice and straight we give our bees a foundation of beeswax with hexagonal indentation as a guide. Without it, bees build comb without direction and create what is called “crazy comb”! Crazy comb results in frames getting stuck together! Similar to “crazy comb,” this small piece of comb was built on the side of the frame because the bees ran out of space. It is removed, drained of honey, and melted down into beeswax. 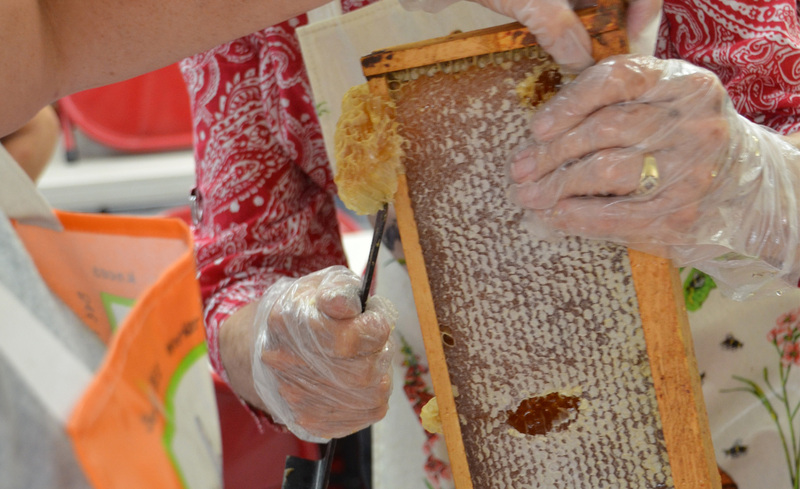 Yes, comb is made of beeswax! 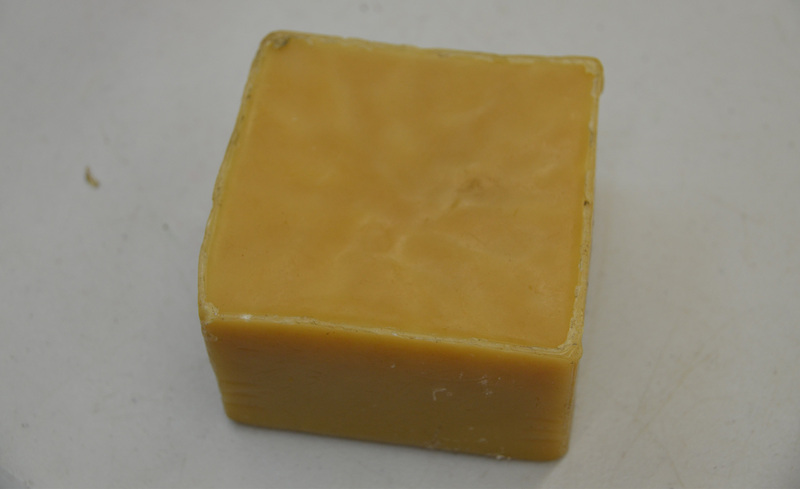 Here is a brick of wax that we’ve saved from our hives and use to educate the public about honey bee resources. Once all the caps are removed, frames are added to the centrifuge to extract honey. This device spins four frames at a time. 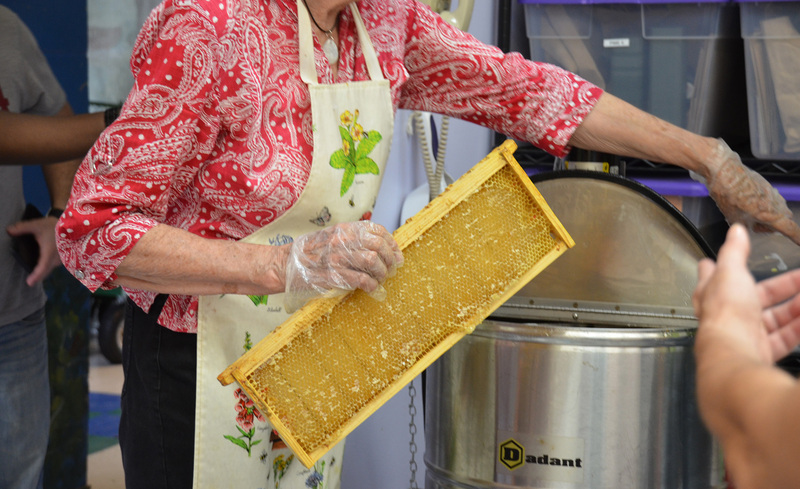 As the centrifuge spins, honey is pulled from the comb to the outside of the device. 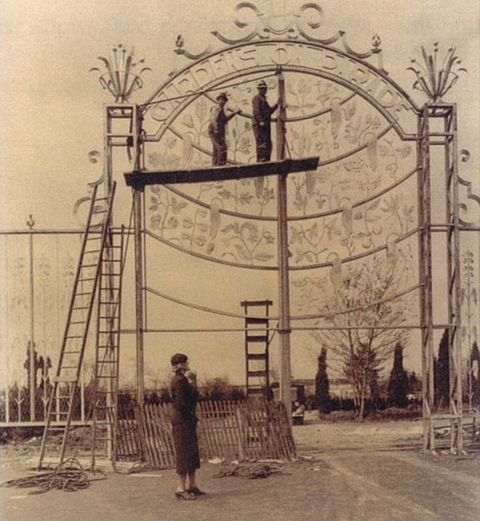 Here, frames are inserted prior to spinning. After spinning for a couple of minutes, the frames are removed and flipped. 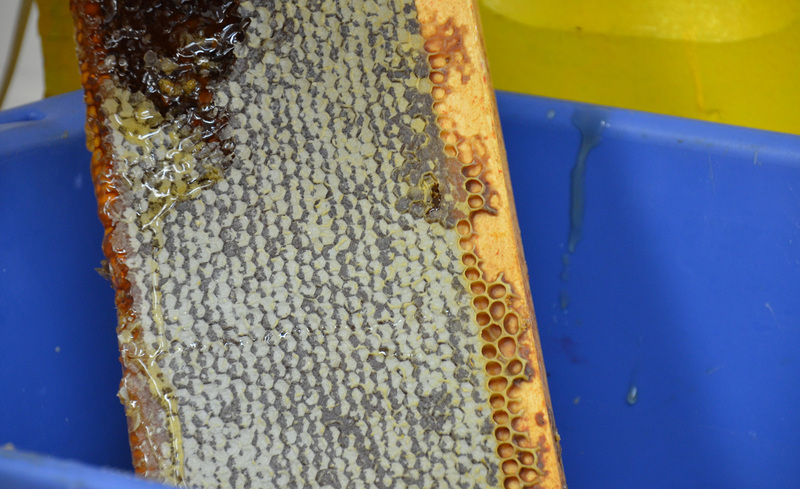 Here is one side of a frame that is now emptied of honey! 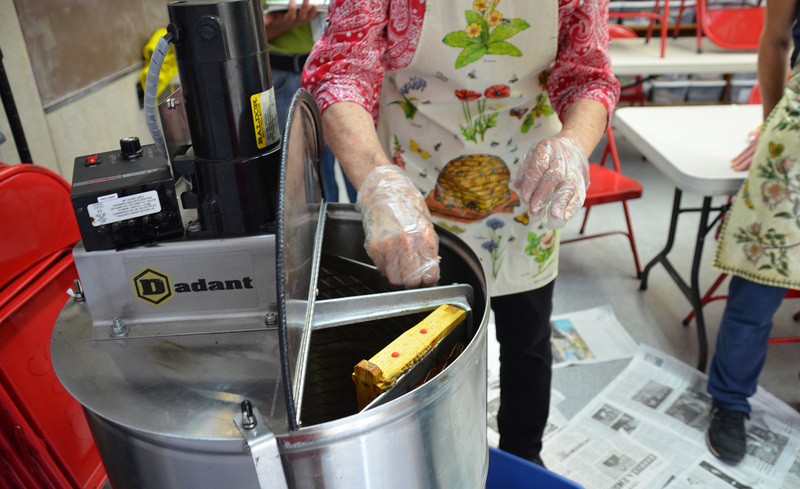 We’ll repeat this process a couple times on each side to get all the honey out. 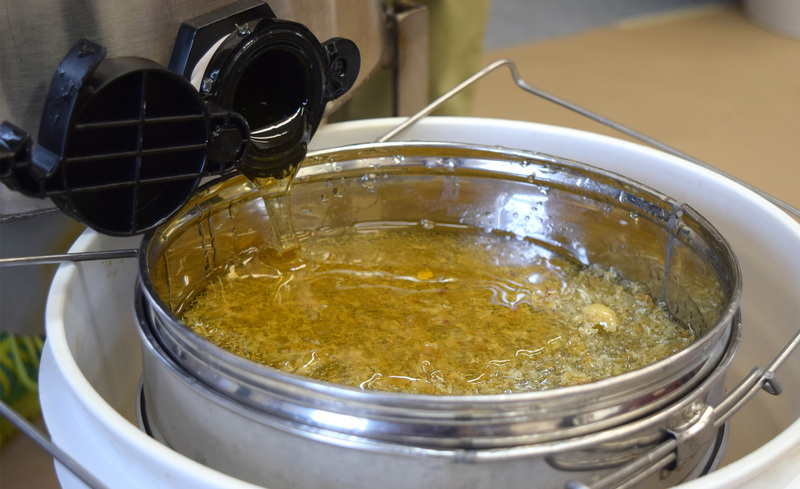 Once filled, the centrifuge’s honey gate is opened and the honey is poured through a double strainer that catches two levels of waste. First, the larger strainer catches bits of cap, comb, and dead bees. The second, narrower strainer catches propolis (bee salvia and tree sap) and pollen. After sitting for a few days, foam that floats to the top is skimmed off. 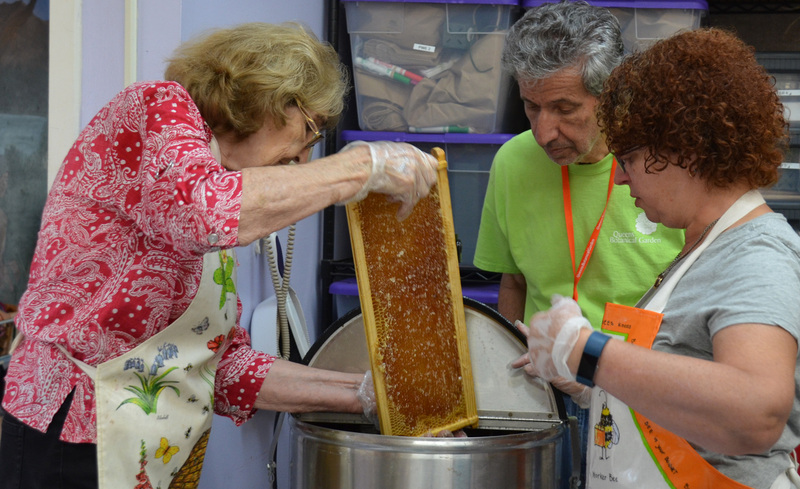 And then finally—we jar the honey! 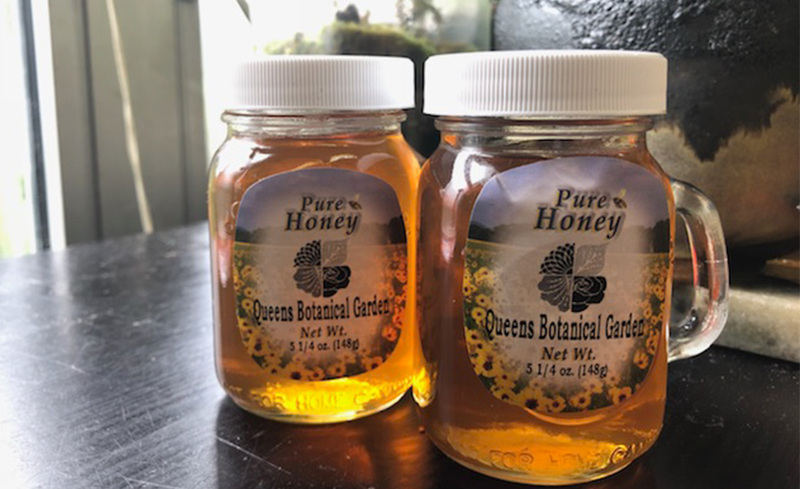 Help support QBG with a symbolic adoption of a honeybee. Your school class can learn about the important role honeybees have in our environment.